Millie’s Dream campaign to provide ten schools in the Henley area with life saving defibrillators has met its target this week. 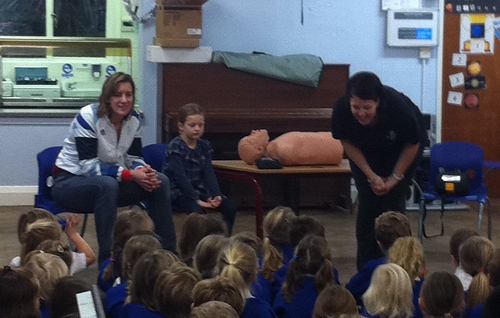 The final defibrillator was presented by Millie Roberts and Katherine Grainger, Vice Patron of the appeal, to Crazies Hill School earlier this week. Sarah Roberts, Millie’s Mum, set up the appeal in October because Millie suffers from a heart and lung condition. The first life-saving device was given to Rupert House School where Millie attends and others have now been installed at Sacred Heart, Badgemore, Valley Road, Trinity, St Mary’s, Sonning Common, Peppard, and Checkenden. The first two defibrillators were donated by local companies; Geos Group and IBS Office Solutions. Money for the others has been raised through donations and fundraising initiatives including a raffle at the Love Henley market. Suzanne Stickley from First Aid Matters also went to Crazies Hill to talk to the the children about what they should do if they came across someone who needed help and the importance of calling for help and ringing 999. The children at Crazies Hill were delighted to meet Katherine Grainger and to see her medal and they had lots of questions for her about the Olympics, rowing and of course Christmas! It is planned that the defibrillator at Crazies Hill will be installed outside so that it can also be used in the local area outside of school hours. Sarah would like to thank everyone who has donated money to the campaign. What a great Christmas present for all the schools.